Over the past couple days, a new addition to Chrome has been uncovered that looks to unify the various apps available on Chromebooks. First discovered as simply the chrome://apps page by Chrome Story, Kyle Bradshaw over at 9to5 Google dug a bit deeper and uncovered an entirely new effort behind the simple settings page that could fundamentally change the way Chromebook users manage their apps regardless of where they installed them from. That effort is being labeled as App Service and it looks to clean up some glaring inconsistencies currently present in the way Chrome OS handles apps. Right now, you get some serious variation in behavior between apps from the Play Store, Linux and the Web. For those of us who’ve used Chrome OS for a while, we understand the differences inherent to the app type, but for new users these inconsistencies often prove difficult to understand and navigate. A simple for-instance: when you right-click on an Android app or a Chrome/Web app, the dialogue to remove/uninstall those apps shows up differently. Further more, if a particular Android app doesn’t have an app icon in the app drawer, the only way to remove it is to dig into the completely separate Android settings and uninstall from there. There is no way in Chrome OS’ settings to do this. Again, for those of us who know what is going on with Android and Linux apps, we’ve grown accustomed to these oddities. For new users, these hurdles likely present some pretty big issues on a daily basis. App Service To The Rescue? – App Registry: list the installed apps. – App Icon Factory: load an app’s icon, at various resolutions. – App Runner: launch apps and track app instances. – App Installer: install, uninstall and update apps. – App Coordinator: keep system-wide settings, e.g. default handlers. Right now, the direct fruit of this effort is the chrome://apps page discovered by Chrome Story that gives users a unified place to see all their installed apps, enable/disable notifications, and pin/remove from the shelf (on Windows or Mac this simply shows installed web apps and/or extensions). It is all a work in progress in the Canary Channel and hidden behind a flag (chrome://flags/#app-management) for the time being, but what we’re seeing thus far is very encouraging. Acording to the the readme file, this whole effort should eventually give users a unified service that manages all apps regardless of where those apps came from. The App Service will handle and manage app icons, app launches, tracking app instances, installation and removal, and system-wide settings and defaults. As this matures, it should usher in an entirely new level of cohesiveness to Chrome OS as a whole, making the now-disparate app ecosystems a much more solid offering. It is unclear at this point if Google will take this the next logical step and provide a unified place for Chrome OS users to simple search for and install apps, but that would be a welcomed and beneficial outcome if it happens. 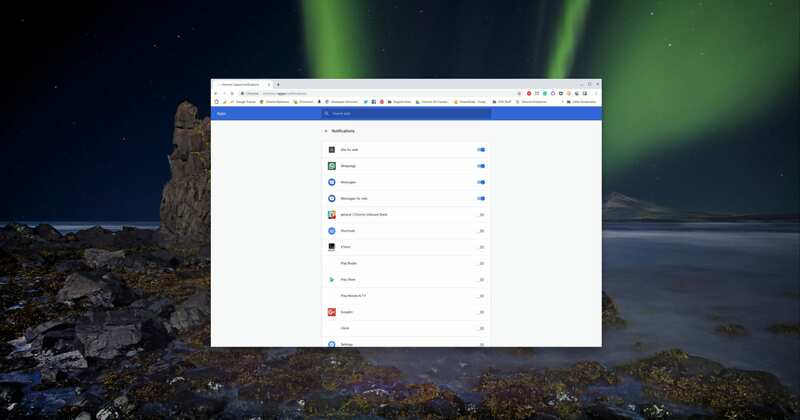 Imagine a revitalized Chrome Web Store that has the ability to search and install apps from the web, the Play Store and multiple Linux repositories while Chrome OS has a unified way to see and manage all of them. That future is tantalizing for sure, but we’ll pump the brakes a bit and just be glad that a central way to handle all our apps on Chromebooks is coming and will make the overall user experience much, much better.